The Painting Gallery includes miniatures, full sized paintings and images painted on other items such as decorative boxes. The artists use mostly oil paint and a mixture of brush and pallette knife. 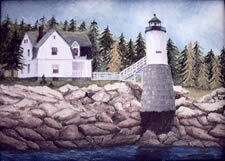 Most of the paintings are of lighthouses and uniquely Maine subjects, but we do like to stretch into other areas at times.